Chase Elliott earned his second Monster Energy NASCAR Cup Series win in three weeks, and the third of his MENCS career, by taking the checkered flag at Kansas Speedway on Sunday in the Hollywood Casino 400. 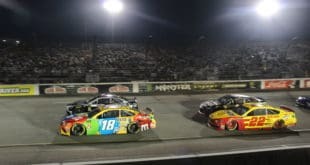 The Hendrick Motorsports driver held off Joe Gibbs Racing’s Kyle Busch and Chip Ganassi Racing’s Kyle Larson, who finished second and third. 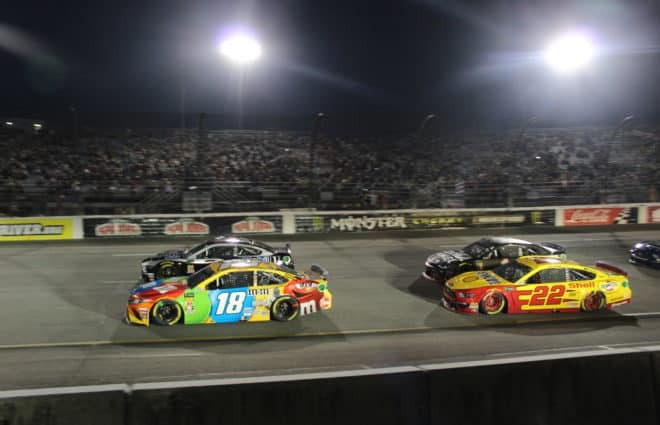 Rounding out the top five were JGR’s Erik Jones and Furniture Row Racing’s Martin Truex Jr.
Finishing sixth through 10th were Team Penske’s Brad Keselowski, Ryan Blaney and Joey Logano, Hendrick’s Alex Bowman and Stewart-Haas Racing’s Aric Almirola. This race was about as exciting as watching paint dry, which is to be expected as it was Kansas, which desperately needs to utilize its ROVAL infield course setup. 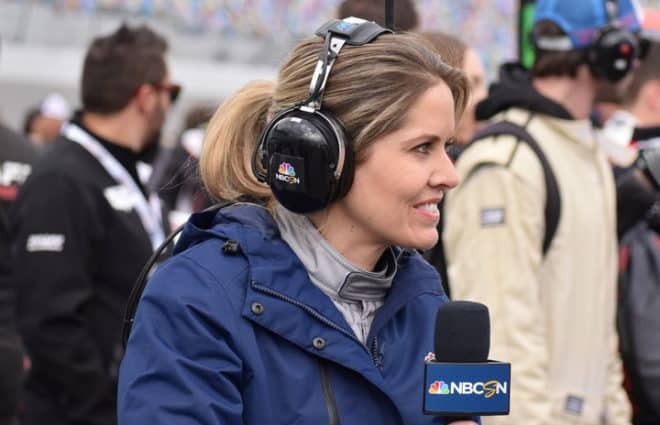 But given the direct competition with the NFL, and to a lesser extent, the NBA, NHL and baseball playoffs, a dull event with one on-track pass for the lead isn’t a good look for NASCAR. Also, the carnage and unpredictably of the XFINITY race the day before made Sunday’s event even more likely to be nap-inducing by comparison. 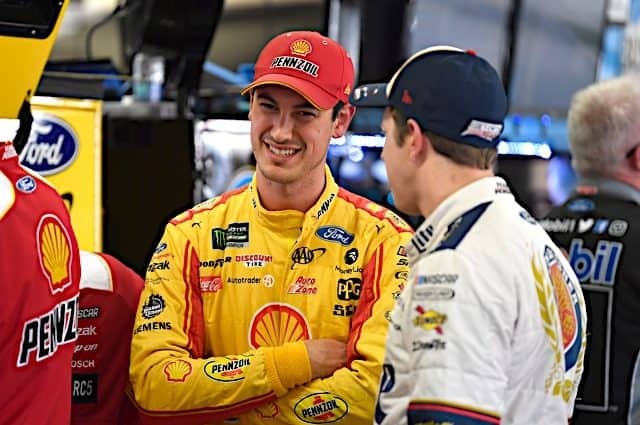 Keselowski, Larson, Blaney and Clint Bowyer were all eliminated from the playoffs, leaving Kyle Busch, Truex, Elliott and Logano to battle with the SHR quartet of Almirola, Kurt Busch, Bowyer and Kevin Harvick for the final four playoff spots. 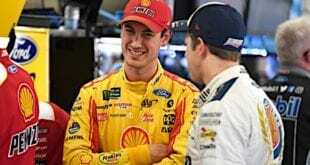 Logano started on the pole and won the first stage, Harvick won the second stage and should have won the race, derailed by a late pit-road speeding penalty. 34 cars were scored as running at the finish, according to NASCAR. Your weekly reminder than Kyle Busch is really good. Despite three DNFs this season, he’s totaled five poles, seven wins, 19 top-fives, 25 top-10s and led more than 1,200 laps in 32 races, and the season isn’t even over yet. 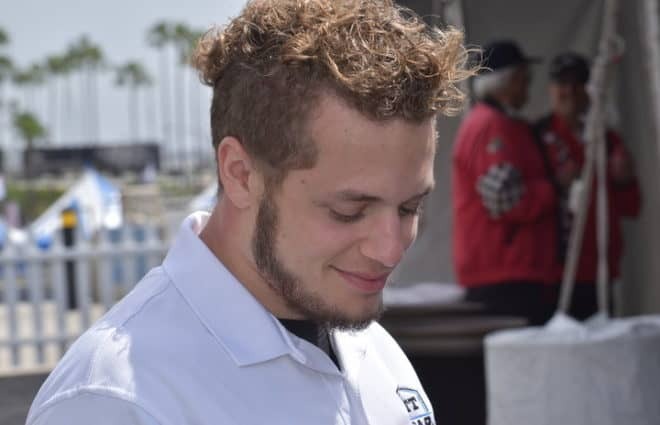 He’s essentially a lock to race for his second series title at Homestead, and was runner-up at Martinvsille this spring. Jimmie Johnson was running around 10th most of the day, but hit the wall hard late in the race and finished 22nd, which dropped his average finish this year to 17.1. The seven-time champion has only two top-fives in 2018, and 11 top-10s, which will result in having a new crew chief next season for the first time in his career. He will also have a new sponsor(s), which still hasn’t been named yet. During his time with Furniture Row Racing (2014-18), Truex won the 2017 championship and 17 races, recording 12 poles, 54 top-fives and 83 top-10s. This season he has four wins, 18 top-fives, and 18 top-10s, with four poles. The No. 78 isn’t finished just yet, even though the Denver, Colo.,-based team is closing down four races from now. 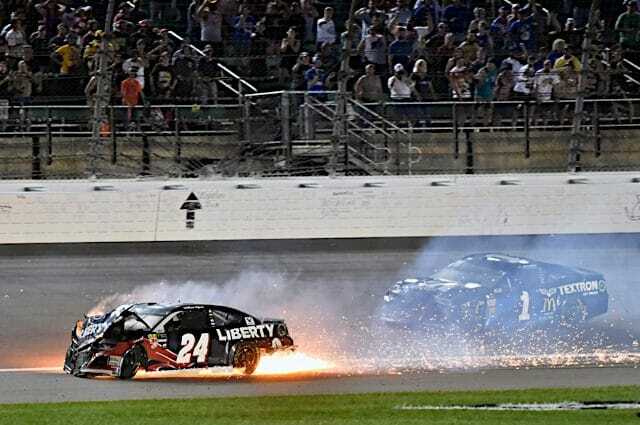 William Byron‘s rough rookie season continued as the engine of his No. 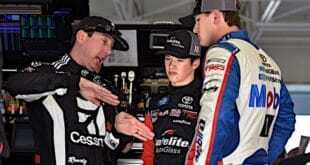 24 blew up, resulting in a 38th-place finish and his eighth DNF of the season, the second caused by an expired engine. His average finish is 22.1, and he only has three top-10s this season, none since Elliott’s win at Watkins Glen, where Byron ran eighth. While he was eliminated following the Round of 12 cutoff, Blaney has done very well in his first full season in the No. 12. He has a win at the Charlotte ROVAL, seven top-fives and 15 top-10s, with at least two more wins that were stolen by terrible luck during a string of crashes in the spring, most of which weren’t his fault. Paul Menard finished in 32nd, his adds to his disappointing season in 2018. He has an average finish of 19.1 and seven finishes in the 30s, with five DNFs. Given Wood Brothers Racing’s alliance with Team Penske, these are very underwhelming numbers, where he should be regularly competing for top-15s, based on his career performance and Blaney’s success in the No. 21 Ford. Chip Ganassi Racing. On the plus side, John Hunter Nemechek picked up his first career win in the XFINITY Series, and the No. 42 leads the NXS owner standings with six wins. Also good news: Larson drove from the back to finish third on Sunday. On the negative side, both Larson and Jamie McMurray had to start the race in their backup cars due to an accident and blown engine, respectively, during practice, Larson was knocked out the playoffs and McMurray finished 17th. With it being October, sports teams of all types are often running pink decals or accessories to supper breast cancer research. Several NASCAR teams went pink this weekend, and Matt DiBenedetto’s No. 32 Go FAS Racing Ford was one of them. 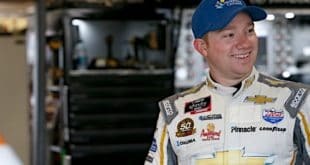 Incidentally, his sponsor this week, racing merchandiser/distributor Plan B Sales, previously sponsored John Hunter Nemechek in the Camping World Truck Series, who picked up his first XFINITY Series win on Saturday. The MENCS and CWTS return to Martinsville this weekend. I said that Keselowski would make the final four, which didn’t happen, and also said that Truex wouldn’t make the Round of 8 (he did). Predictions can be tough sometimes. Clint Bowyer won the snow-delayed spring race, but eight different drivers have won the past nine Martinsville races, so picking out a sure winner is difficult. The usual suspects are all good choices for your fantasy teams this week. I wouldn’t be terribly surprised if Denny Hamlin punted Jeffrey Earnhardt. Here’s why: Earnhardt’s indirect role in keeping Hamlin from Victory Lane several times this season, Hamlin’s elitist comments about backmarkers several times this year, and Hamlin showed that he’s not above spinning people in this race last year by turning Elliott. The First Data 500 will go green around 2:30 p.m. ET on Sunday, Oct. 28, with TV coverage on NBCSN.